Do you feel frustrated and worried that you cannot be as active as you'd like? Or perhaps you find it difficult to play with your kids or go for a run without pain or feeling embarrassed? We understand your frustrations and concerns and want to provide you with solutions and the attention you deserve. At Revitalize Physical Therapy, we provide hands-on, one on one, personalized care in a private, comfortable setting that will get you better, faster. Our priority is to help you live a healthy, active life and do the things you enjoy the most such as playing with your kids. Dr. Heinecke is the expert for prenatal and postnatal care, incontinence, low back pain and female sports injuries in the Milwaukee area. Her comprehensive approach helps patients get better, faster and have better long term success. 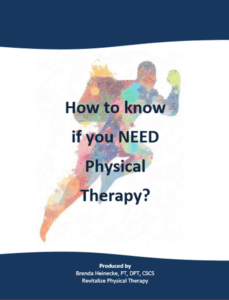 Get all of your questions answered in our FREE report, "How to know if you NEED Physical Therapy." Are you currently pregnant or recently had a baby and are looking to return to an active lifestyle without pain? We are specialized in pre and postnatal care to help you have an easier delivery, faster recovery, and less complications. Has your back pain been limiting your ability to work, play with your kids, and sleep through the night? We help people just like you all the time and give them a long term solution for an active, painfree life without relying on surgery or pills. You don't have to feel embarrassed or worried anymore about leaking urine while playing with your kids or being active! We have the solution for you so you can have a healthy, active life without wearing bulky pads, taking pills, or having surgery. Our approach to treating sports injuries gets athletes better, faster so they can continue to compete and have fun. We also specialize in injury prevention for athletes looking to have longevity in their sport and not get laid up with a costly injury. “I had severely injured my back 2 years ago lifting some furniture at my house. Dr. Brenda came to the rescue with a program to help rid me of the back pain. Within two weeks I was back racing dirt bikes in the 2 hour race format, finishing first for the year in my class. I have continued to use the program since my injury and have been able to enjoy pain free days. Group and private sessions that focus on whole body strengthening and flexibility that is low impact and easy on the joints. For athletes experiencing pain during their sport or looking to improve their performance. Video captured allows for the analysis of alignment and body mechanics. Whether it's pelvic floor therapy during pregnancy or postpartum or treating sports injuries for athletes, our hands-on, personalized technique helps decrease pain to get you healthy and active. We want to help you have a healthy, active life without pain, pills or surgery. If you're still not sure if we can help you, let us show you. Inquire now about how we can help you get better, faster.